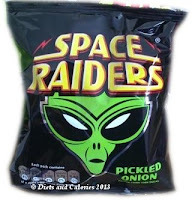 Space Raiders are corn based, baked snacks which come in one flavour – pickled onion. They’re available in multi-bags of 10 in Poundland and have only 64 calories per pack. I have to say, these aren’t the sort of snack I’d gravitate towards in the supermarket. 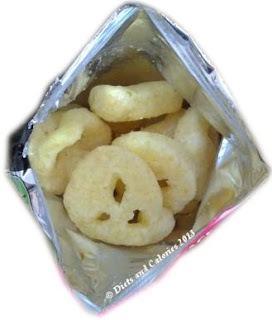 In fact, the only way I found out about them was when an empty packet appeared in my daughter's lunch box one day. 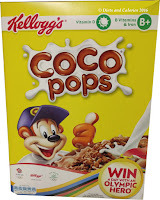 Once glance at that lurid green alien on the front of the pack left me horrified at what my daughter must have been eating. Quizzing her about them, she said they’d all been given a pack during the after school club as a ‘treat’! However, you can’t always judge a book by its cover as they say, and on closer inspection, they weren’t quite as bad as I imagined. For a start, there were only 64 calories per pack, so no great worries about excessive extra calories. These corn snacks are also baked rather than fried which should mean they have a lower fat content. 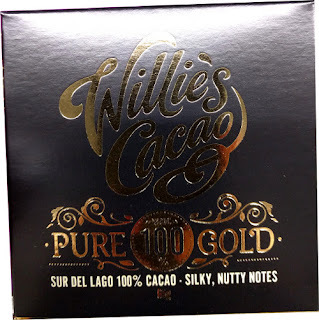 Looking at the overall nutrition, they are low in sugar, but have a high level of fat and salt. 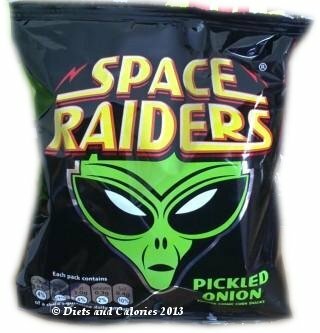 One bag of Space Raiders provides 10% of a child’s daily salt requirements. I ended up buying a multi-pack of these snacks, mainly because they were lower in calories but also to see what they tasted like. I wished I hadn’t bothered. The flavour is far too strong for my tastes and actually tastes like sharp vinegar. Way too salty as well. Why do kids like these things? As far as I’m concerned, the best thing about them is the small number of calories. This is helpful if you like strong, savoury, salty snacks and are watching your weight. 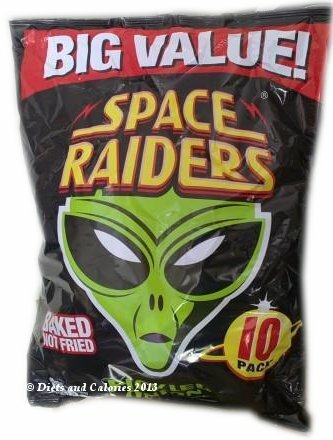 And the fact they only cost £1 for a pack of 10 is likely to be a plus factor for many looking for cheaper snacks. However, it's not a price I'll be paying again. 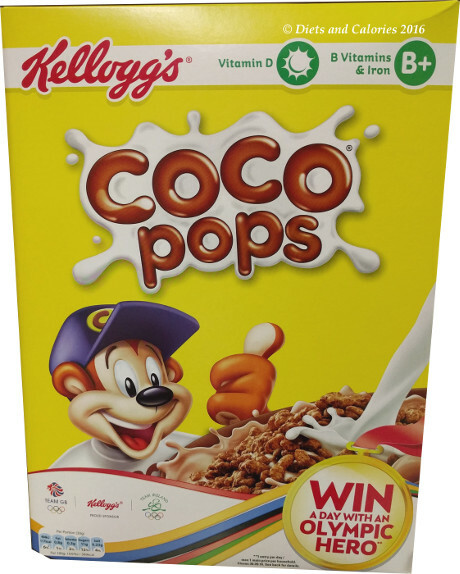 Nutrition Information per pack: 64 calories, 0.8g protein, 8.1g carbohydrate, 0.3g sugars, 3.0g fat, 0.3g saturates, 0.1g fibre, 0.4g sodium. Suitable for vegetarians. Thanks for that Joey. I guess the stock will vary from store to store.